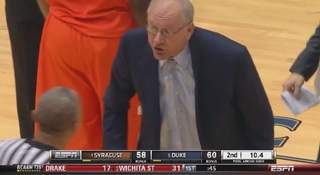 Jim Boeheim is one of the best coaches in the history of college basketball. Tonight, he lost his cool on a controversial offensive foul call, getting two technical fouls and an ejection in the process. His tirade resulted in the game ending in a push, when Syracuse bettors looked golden to cover just before the incident. The line sat at or around Duke -6, with Duke winning the game 66-60. God dammit, Boeheim.